The British Safety Council is a global health, safety and environmental charity. 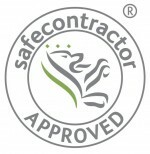 Working with businesses to improve their health, safety and environmental management. They campaign and influence, and are champions of young worker safety. Their vision, and one that we share is that no one should be killed, injured or made ill by work activities. The National Association of Shopfitters (NAS) introduced PAS 82 Shopfitting Management Standard (BSI) in 2006. In 2009 it was re-introduced as an auditable protocol. PAS 82 seeks to provide a standard that requires an acceptable level of accreditation and flexibility, the appropriate levels of corporate governance and high standards that are recognised throughout the industry. It demonstrates to the wider industry the advantages that a client can get from using an NAS member. The Eurosafe UK CDM Competent Scheme part of the Safety Schemes in Procurement Forum (www.ssip.org.uk) is a health and safety assessment based on the requirements of the CDM Regulations 2007 and other workplace related legislation. Eurosafe UK assist clients in discharging their onerous duties relating to assessing the competency of suppliers they appoint to undertake work on their behalf. ISO 14001 was first published in 1996 and specifies the actual requirements for an environmental management system. It applies to those environmental aspects which the organization has control and over which it can be expected to have an influence. It is the only ISO 14000 standard against which it is currently possible to be certified by an external certification authority. The National Association of Shopfitters (NAS) is the only trade association that exclusively represents, promotes and is dedicated to service the needs of the shopfitting and fit-out / interior contracting sector; within the global sphere of construction and has been doing so successfully since 1919. A leading health and safety pre-qualification assessment scheme dedicated to promoting higher standards of competence and compliance through the provision of relevant industry specific and tailored health and safety assessments for all professions and sectors.